Works like a Jig Saw for Glass! New version features faster, stronger motor, six blades, plus replacement guide blocks and blade chuck. You won't need to reorder parts any time soon! This is the ideal, low maintenance saw. This is the perfect saw for you if you want the best performance with the least maintenance! Blades are nearly indestructible. 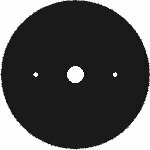 When it is time to replace a blade, a three-pack runs a fraction of the cost of band or ring saw blades. Easy to use, gives your glass a nice, finished edge with NO CHIPS. Simple and straight forward design means no alignments, no blade adjustments and next to no maintenance. GRYPHON MODEL C-40, THE FINEST BAND SAW ANYWHERE! 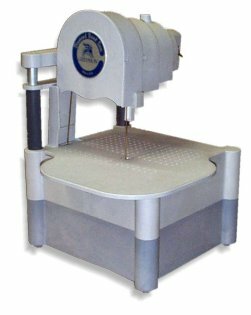 Gryphon makes the finest, most trouble free band saw on the market. Not to mention it is also the FASTEST with a blade speed of 40 mph. 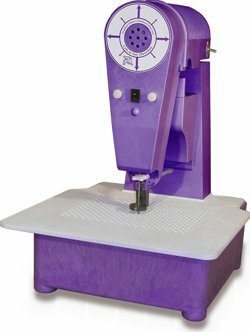 We have sold hundreds of these saws to hundreds of happy crafters! This saw has the fewest moving parts, the motor is located ABOVE the water reservoir, there is only ONE adjustment you need to worry about ... all of this makes Gryphon's Model C the easiest to use and maintain. Gutsy 1.1 peak hp DC motor won't bog down when cutting steel or brass. Built-in fence and "Chop Saw" action for fast, safe cutting. Gryphon's Came Saw is a fast cutting saw that makes easy work of cutting zinc, brass or copper came plus steel or zinc rebar. 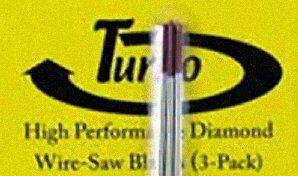 If you use zinc, brass or copper cames or any kind of Rebar, you will want this saw! MADE IN USA. 1 year warranty. Note: Composite blade is not recommended for use with lead came.